David Phelps Classic premiered July 26, 2013. Hear grammy-winning tenor David Phelps. Grammy-winning tenor, David Phelps, is credited among today's most spectacular voices. He has brought the house down in the world’s most prestigious venues with his seemingly endless vocal range (which extends more than three octaves) and his one-of-a-kind panache for communicating a song. A Baylor University graduate with a degree in vocal performance, David is also a gifted arranger who has a special touch for giving classic American favorites a fresh sound with hints of pop melodies and modern harmonies. David is a member of the renowned Gaither Vocal Band, has received two Grammy Awards and four Dove Awards, and is featured on numerous chart-topping recordings. His most recent live concert event, Classic, takes viewers on a beautiful and eclectic musical journey through the musical influences that have shaped his life and award-winning career. 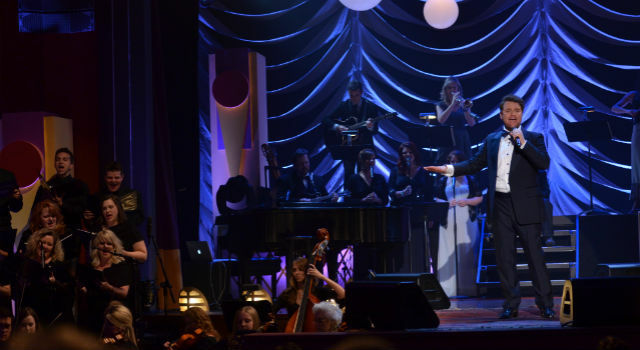 Filmed in the historic Franklin Theatre in Franklin, Tennessee, David Phelps Classic features David’s world-class vocals backed by a live orchestra, a choir from Nashville’s Christ Church, and his own touring band. This night of music reveals David’s artistic range as not only a vocalist, but also a composer, arranger and musician, and offers a heart-warming glimpse of his talented family and friends. Having grown up in a musical family, David is often surrounded – both on- and off-stage – by incredibly talented family members. Among those who shared the stage with him for this Classic celebration are his two sisters, his brother-in-law, and all four of his children. Among the numerous highlights of the evening is a stunning duet with David’s then-15-year-old daughter, Maggie Beth, a budding classical soprano, who joins him on “Agnus Dei.” Joining David on “You’ll Never Walk Alone” is his older sister, Sherri Proctor, whose courageous battle with cancer ended shortly before the release of the program. A family man indeed, and a performer extraordinaire, David tours both as a solo artist and as a member of the Gaither Vocal Band. He resides on a farm outside Nashville, Tennessee, where he spends every possible moment of his spare time with his wife, Lori, and his growing kids. He has used his little-known carpentry skills to renovate an old barn into an elegant concert venue, where some of his earlier video releases were filmed. in association with WKNO National Productions. Own this DVD to hear features the award-winning tenor at his very finest.